Dr Brendon Neuen is an NHMRC supported PhD candidate at The George Institute for Global Health, currently based at the University of Oxford, where he is also reading for an MSc in Global Health Sciences and Epidemiology as a Clarendon Scholar. Prior to this, he was a medical registrar at Royal Prince Alfred Hospital and a Clinical Lecturer at the University of Sydney, Australia. 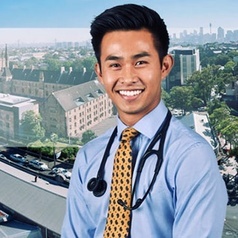 He has trained and worked across diverse settings from tropical Far North Queensland to inner-city Sydney, where he was Resident of the Year at St Vincent's Hospital in 2015. The broad aim of his clinical and research work is to better understand and prevent the progression of chronic kidney disease (CKD) and its complications, particularly in vulnerable populations both in low and high-income countries. He has published over 35 peer-reviewed articles and conference proceedings, including work featured in The Lancet, Circulation, and Kidney International. In addition to this, he has a special interest in global health and medical education. He currently serves as an International Society of Nephrology (ISN) Global Kidney Health Atlas Fellow, and is a member of the ISN Education Working Group and the Australasian Kidney Trials Network CKD Working Group. He can be found on Twitter as @brendonneuen.